We are happy to announce a new release of Rfam (version 12.2) which includes 115 new families, introduces R-scape secondary structure visualisations, and restores missing families to multiple Rfam clans. This release adds 115 new Rfam families bringing the total number of families to 2,588. Notable additions include Pistol, Hatchet, Twister-sister and several other riboswitches contributed by Zasha Weinberg. We are always looking for new RNA families, so please feel free to get in touch with your suggestions. According to R-scape, the secondary structure from the Rfam seed alignment, shown on the left, has 19 statistically significant basepairs (highlighted in green). R-scape can also use statistically significant basepairs as constraints to predict a new secondary structure that is consistent with the seed alignment. Using this approach, R-scape increased the number of statistically significant basepairs from 19 to 27 while also adding 9 new basepairs that are consistent with the seed alignment (structure on the right). This visualisation gives an idea about the quality of the Rfam structure and indicates that in this case it may need to be updated. To find out more about R-scape have a look at a recent paper by Rivas et al. Tip: R-scape visualisations are interactive, so you can pan and zoom the structures and get additional information by hovering over nucleotides and basepairs. R-scape analysis suggests that many existing Rfam secondary structures can be improved (for example, FMN riboswitch or 5S rRNA). In other families secondary structures are not supported by the R-scape covariation analysis (for example, oxyS RNA) which indicates that either their seed alignments need to be expanded or that these RNA families do not have a conserved secondary structure. Lastly, there are also cases where the R-scape structures do not show significant improvement compared to the current secondary structure (for instance, Metazoa SRP). In future releases we will begin to improve existing Rfam seed alignments by using R-scape in the family building pipeline. In the meantime, Rfam users can get an indication of the quality of the structure using R-scape visualisations. Since Rfam 10.0, related Rfam families have been organised into clans. The clans are manually curated and clan membership is checked using automated quality control steps (for example, to make sure that a family cannot belong to more than one clan). However, under certain circumstances these quality control procedures silently removed families from the clans. This bug was introduced in Rfam 11.0, and over time, more than 30 families were dropped from 20 clans, so that some clans did not have any families at all. The problem has now been fixed and proper clan membership has been restored using Rfam releases from the FTP archive. 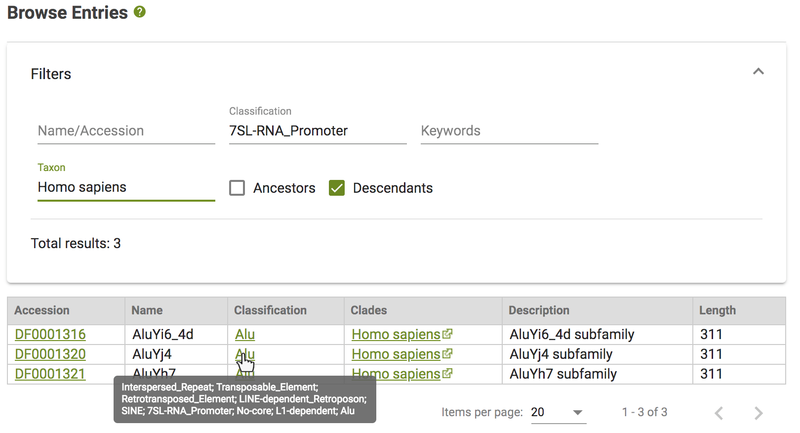 You can explore Rfam clans and let us know if you have any feedback. Rfam sequence search and the cmscan web service were updated to the latest version of Infernal (version 1.1.2). We now provide track hubs for both hg38 and hg19 human genome assemblies. The source code for the Rfam website is now available on GitHub and can be run locally using Docker. In addition to the Rfam website, you can access the data in the FTP archive and via the API. There is also a public MySQL database introduced in the last release. As well as revisiting Rfam seed alignments, work is underway on the next major Rfam release (13.0) which will be based on a new sequence database built from complete genomes. We plan to make the new data available in late 2017. We always welcome comments and feedback about Rfam, so feel free to get in touch by email or by submitting a new GitHub issue.